Among the different types of skin cancer, basal cell carcinoma (BCC) is the most common in the UK and one Dr Glass sees frequently at his clinic on Harley Street. 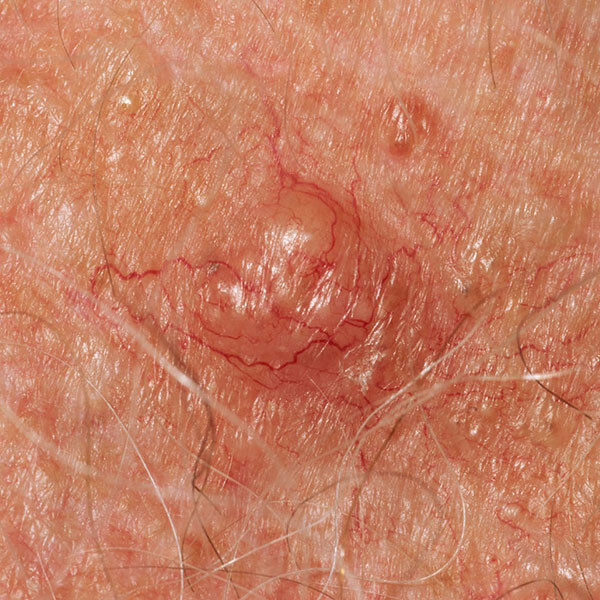 The cancer takes on a number of forms but classically appears as a waxy bump on the skin and is often found on areas exposed to the sun. Hence, most cases often affect the face and neck. When a biopsy confirms the presence of BCC, treatment becomes the next step. Dermatologists, have different ways of removing or destroying the cancer. The treatment chosen depends on the size, location, and which sub type of BCC. The patient’s age, health status, and medical history are also considered when deciding the plan of action to take. Dermatologists treating BCCs normally do so on an outpatient basis, the procedure is often minor and usually involves only minimal discomfort. The surgeon removes the cancerous tissue and a margin of the surrounding normal skin using a scalpel. He or she then closes the site with sutures. The tissue is sent to the lab for further tests. Excision has a very high success rate. Extreme cold destroys tumour cells, hence its application in medical science. Cryosurgery utilises liquid nitrogen and is applied to cancerous lesion. It is effective in superficial BCCs. Doctors sometimes need to repeat the procedure until the entire cancerous tissue is destroyed. After treatment the area can blister and forms a scab, which then falls off leaving a red mark which usually fades over time often leaving a pale area of skin. Superfical tumours respond well to curettage and cautery. The surgeon scrapes off the tumour with a curette and stops the bleeding with electrocautery. In the right hands it can be as effective as excision. As with any surgical procedure there will be a red mark left on the skin which fades to a pale mark with time. This involves removal of the skin layer with the lesion. The specimen is usually frozen and immediately examined under the microscope to ascertain if the BCC has been fully removed. Further excision is necessary when cancer cells are seen at the edge of the initially excised skin specimen. This procedure is mostly used for BCCs on the face near the nose, eyes or mouth; especially when the edge of the BCC is difficult to determine. Mohs is the most effective form of treatment in this situation, it is time-consuming. Superficial BCCs may respond to Imiquimod. Cure rates are good. No surgery is needed. The patient only needs to rub the cream on the lesion 5 times a week for 6 weeks or more depending on doctor’s specifications. Another topical cream for used for BCCs is 5-Fluorouracil. It has similar effectiveness to Imiquimod. The cream is applied to the tumour twice a day for about a month. Both creams cause inflammation and irritation of the area treated.